A dazzling history of the modest family that rose to become one of the most powerful in Europe, The Medici is a remarkably modern story of power, money, and ambition. Against the background of an age that saw the rebirth of ancient and classical learning Paul Strathern explores the intensely dramatic rise and fall of the Medici family in Florence, as well as the Italian Renaissance which they did so much to sponsor and encourage. Interwoven into the narrative are the lives of many of the great Renaissance artists with whom the Medici had dealings, including Leonardo, Michelangelo, and Donatello, as well as scientists like Galileo and Pico della Mirandola. 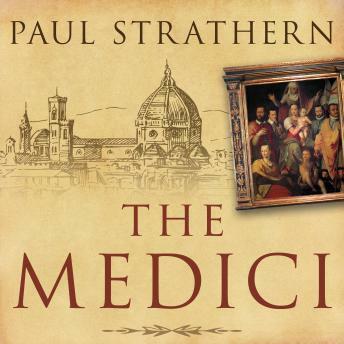 In his enthralling study, Strathern also follows the fortunes of those members of the Medici family who achieved success away from Florence, including the two Medici popes and Catherine de' Medici, who became queen of France and played a major role in that country through three turbulent reigns.